Larger Tea Ball Infuser 2.5 inch 65mm 18 8 S Steel. 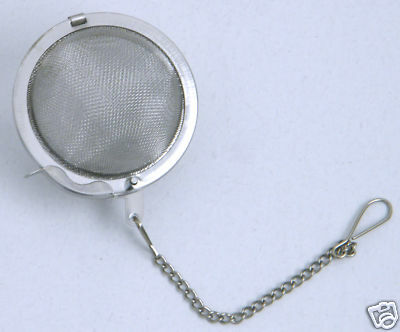 Home / Accessories / Infusers & Strainers / Larger Tea Ball Infuser 2.5 inch (65mm) 18/8 S/Steel. Quality Top Grade Food Quality. Size 2.5 inch (65mm) nominal. Holds enough tea for 1 large mug or a 2-4 cup teapot. Make your tea straight inyour cup, mug, jug or teapot. A perfect 2 to 4 cup strainer / infuser in stainlesssteel. Extremely useful for any loose leaf tea but really comes intoit's own when serving Green, White or Oolong Tea. These tea's can allbe re-infused 3 to 4 times each so Remove the tea ball when your drink is ready, place on a saucer or spoon rest and your leaves are there ready toinfuse again and again with little fuss or effort. Can also be used in a 2/4 cup jug or teapot.